't Moerhuisje is situated in the rural town of Moerhuize. It is a tasteful, modern equipped apartment (on the first floor) that is part of an earlier farmstead. Enjoy your holiday while you have a wide view from the terrace of the meadow around the house where you can see the horses and the sheep grazing. Amusement outside the house is of course also possible. Try a fantastic mussel or eel dish, the regional speciality of the creek area or discover for example the surrounding area of Moerhuize. 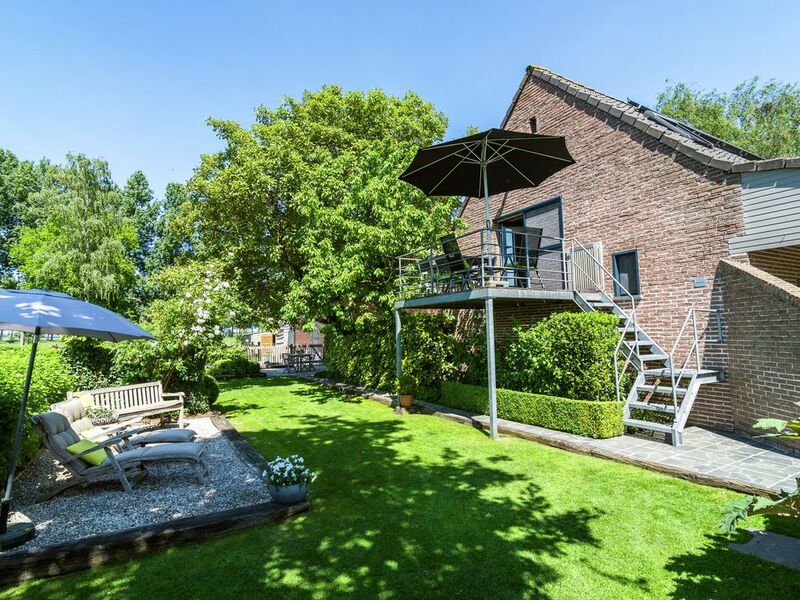 Moerhuize is situated in the borough of Maldegem on the edge of the creek area with its many marked cycle routes. The borough of Maldegem is known for its steam museum, the Japanese, French and English gardens and the Canada museum. Maldegem also has magnificent vast nature reserves and winding rural paths everywhere in the borough invite you to walking or fishing. An absolute must! Really enjoyed staying at Moerhuizestraat for a week at Easter, the apartment was lovely, and Annick was very friendly and very helpful. The stable block with two horses was a favourite for my daughter and plenty of good flat bike riding routes away from traffic for all the family. Good location for Bruges, the coast and most of the Flanders region, and Zeeland in the Netherlands as well. It was a long weekend, so only 2 days ...... enough to enjoy a bit of relaxation. Fabulous apartment above the large garage/annex of the owners home next door (reassuring that lovely owner available if needed but leaves you in peace if not). Well equipped and more spacious than website photos suggest (large dining table, 3 piece suite, kitchen hob not visible on photos) with bonus reading area, own balcony with dining table and chairs (facing sunset overlooking fields of cows and sheep), and own sun lounger area below. Fly-screens on the windows protect from the inevitable midges and mosquitos in the Belgian polderlands in summer. We chose this apartment for its convenient location for day trips by car - Bruges 20m, Ghent and coast 30m, Brussels 1 hr. Bruges and Ghent are famous beautiful tourist towns and both stunning - speedy canal rides and horse and carriage rides highly recommended. Brussels was amazing too with the Grand Place having even more stunning architecture than Bruges! Knokke-Heist on the east end of the coast has miles of fabulous beach (recommend hiring a family sized bike along the promenade) with wind-sheltered cafes and international designer boutiques and art or sculpture galleries. The apartment's location is equally great for cycling and walking - canal a short stroll away and many local official routes available. The bespoke designed apartment is on four sub-levels so a few open steps within the apartment. For our family (kids 7 and 10) this added to the appeal, though it would not be suitable for toddlers or anyone mobility impaired. The second bedroom (bunk plus single) is small with minimal storage space so is better suited to 2 rather than 3 kids. Overall, a great, individual, high quality, well equipped apartment. We had a fabulous holiday there and our kids enjoyed the welcome home from the owners little dog each day. Wished we could have stayed longer - so comfortable and so much to do and see! we had a very warm welcome by our host, who made us feel very much at home. unfortunately the weather was poor, and it was quite cold in the flat when we couldn't go out. but it is very well situated for visits to Bruges, Chent. Knokke-Hiest and Brussels, all of which we visited - as well as going over into the Netherlands. People in the UK whom we told about our holiday were surprised that we had two weeks in Belgium [?] - what is there to see and do? lots and we enjoyed it ? thanks for helping with the arrangements. Spotless! No explanation fascilities upon receipt. Not clear to approach with questions. Whom Acc. Bover was the pub, smoke rose up. Was very bothersome "evening.